Rhyolite, in the Bullfrog Hills, near the eastern edge of Death Valley. 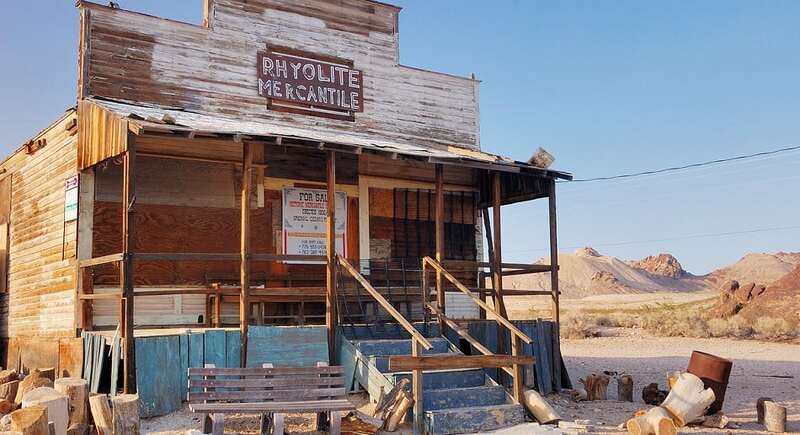 The town began in early 1905 when thousands of gold-seekers, developers, miners and service providers flocked to the Bullfrog Mining District By 1907, Rhyolite had electric lights, water mains, telephones, newspapers, a hospital, a school, an opera house, and a stock exchange. The population ranged between 3,500 and 5,000 in 1907–08. But the town declined almost as rapidly as it rose. After the ore was exhausted, the 1906 San Francisco earthquake and the financial panic of 1907, it became difficult to raise money for the local mine and it was closed. Many out-of-work miners moved elsewhere and by 1920 there was almost no one left.